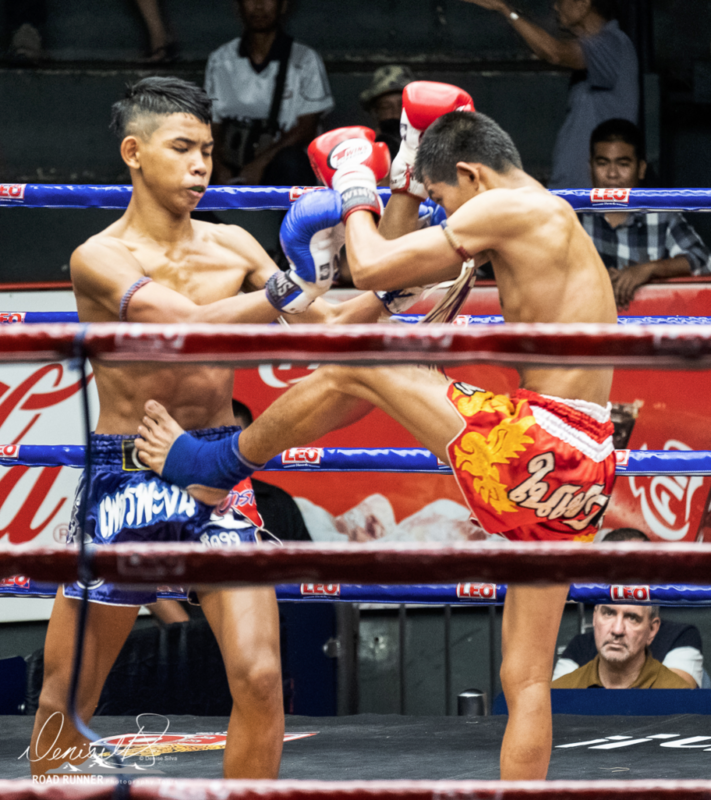 Steeped in tradition, Thai boxing, known as Muay Thai, is a combat sport that uses boxing, kicking, and clinching techniques. The discipline is known as the “art of eight limbs”, as it combines the use of fists, feet, knees, elbows, and shins. The sport is not as violent as one might think, as compared to cage fighting in the United States. 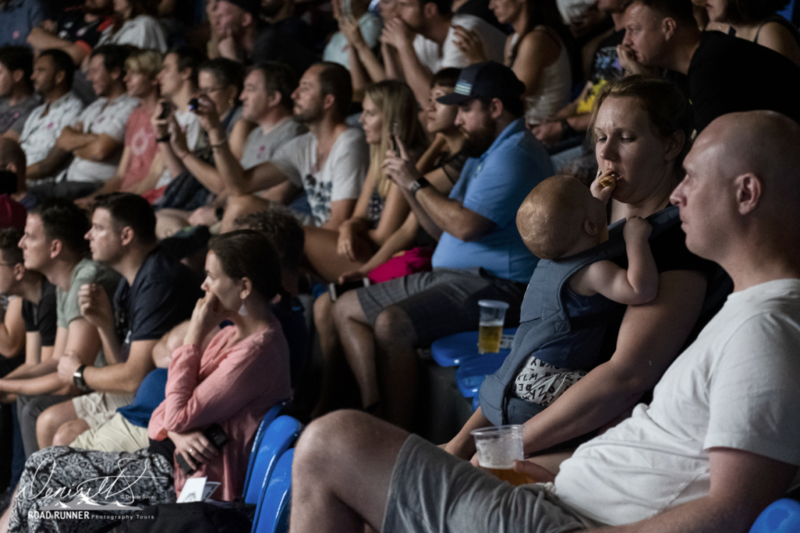 The sport draws its fans from a wide swath of the public, as seen in this image. 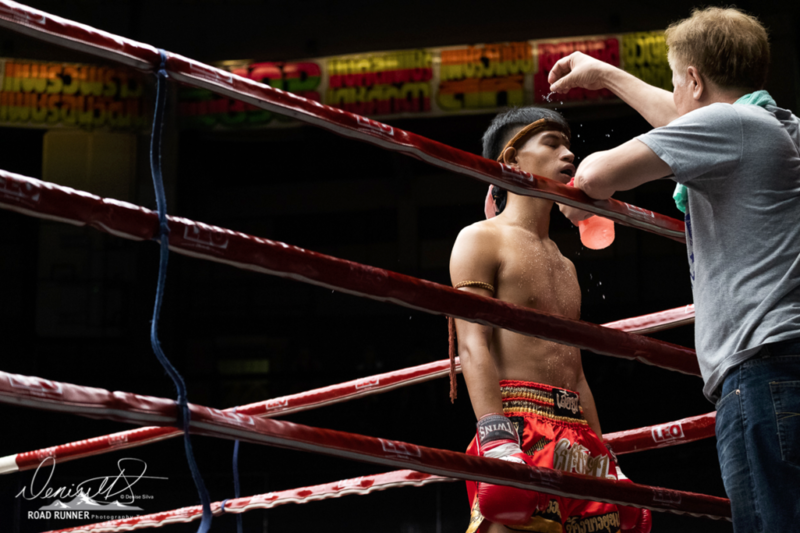 At the beginning of each fight, the combatants enter the ring adorned with headbands (mongkohn) and armbands (pra jiad) supporting the colors of their gym. 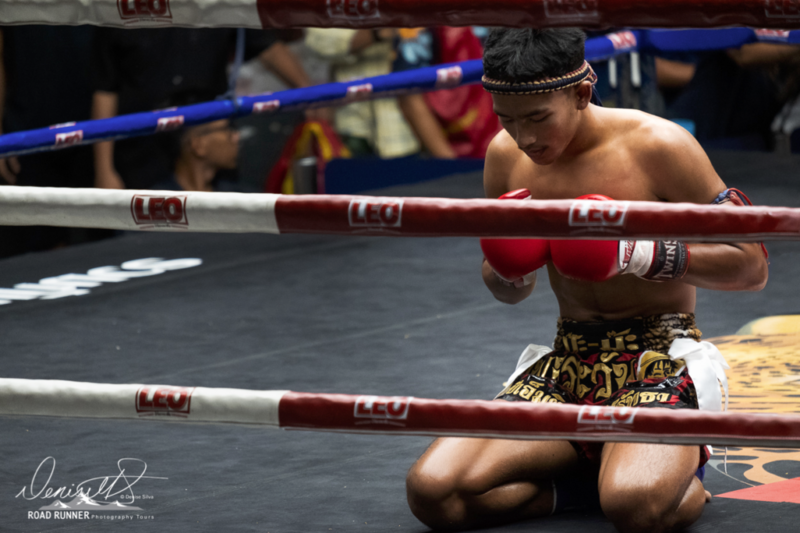 The tradition of these adornments originates back to a time when Thailand was in a constant state of war, and you men would tear pieces of clothing from loved one’s clothing to wear into battle for good luck and to ward off evil spirits. 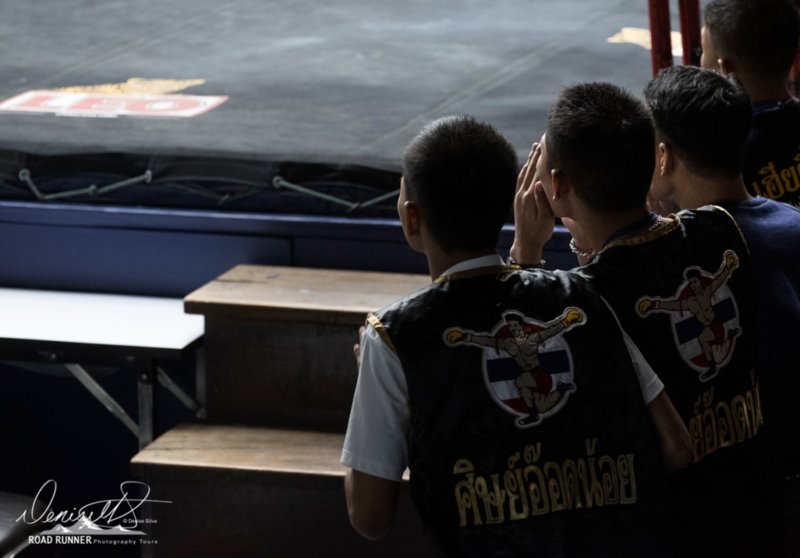 They each move through the ring, performing the ritual “wai kuru ram muay,” Wai is a traditional Thai greeting with the palms together as a sign of respect. 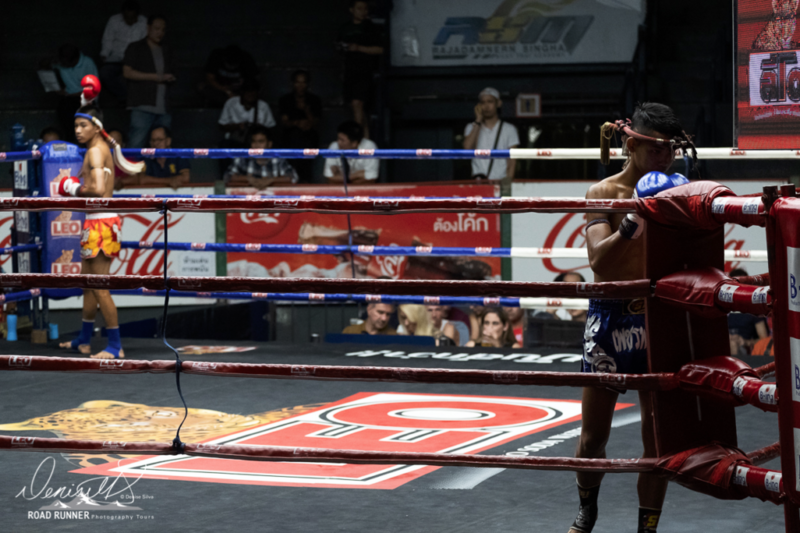 Khru is the Thai form of the Sanskrit word guru meaning teacher. 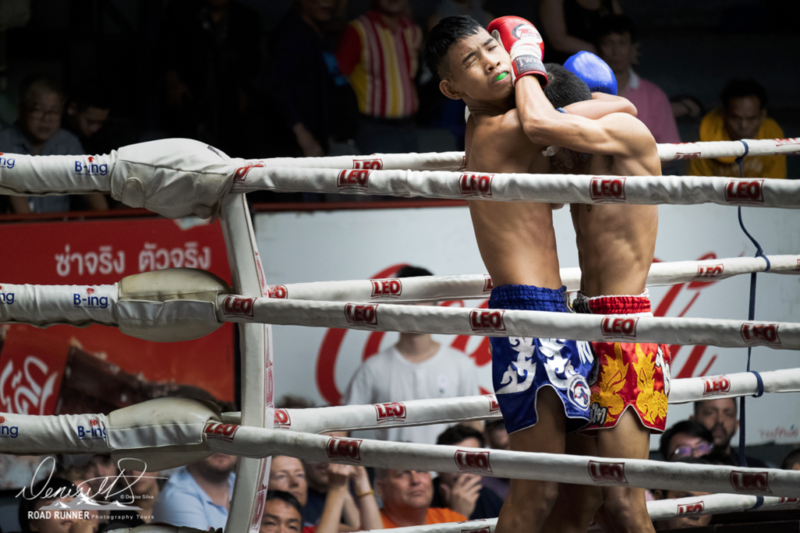 Ram is the Thai word for dancing in classical style, and muay means boxing. 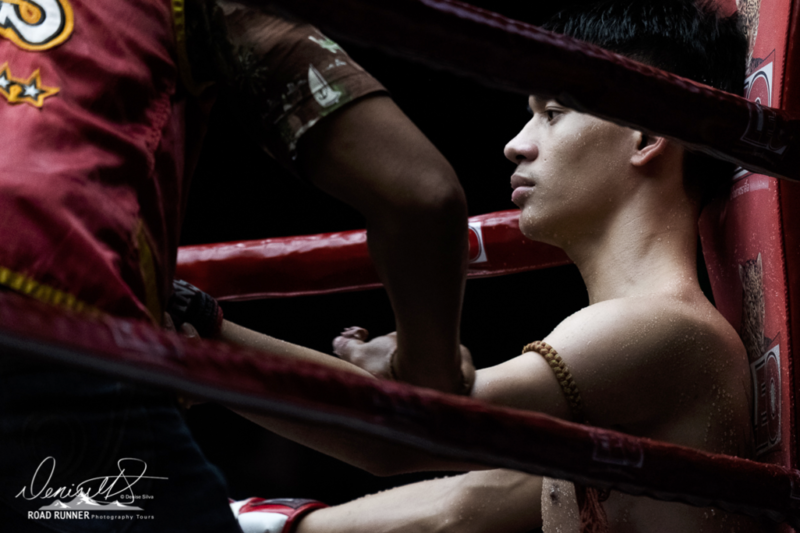 The fighters move around the ring, praying to each of the corners, paying homage to the sport, and seeking blessing before the fight begins. Once the fight starts, the intensity and focus are clearly seen on their faces and in their actions. Their bodies are honed machines that are trained to take the punishment of punches and kicks for up to 5 rounds, each lasting 3 minutes. You can see from some of the images, the fighters are quite young. 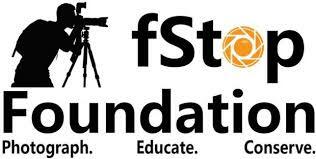 In fact, children between the ages of 9 to 15 do participate. 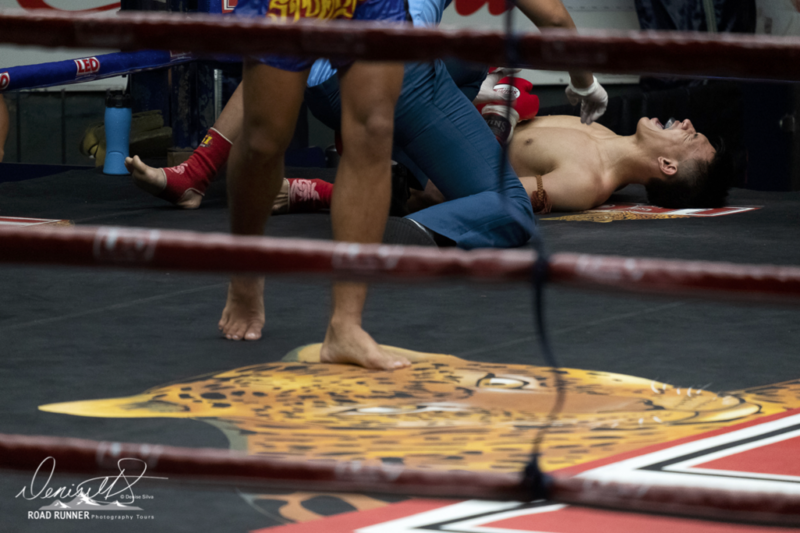 There is currently a petition in place to only allow “light contact to the head and fact” in young combatants. The petition has not yet been ratified, but the World Conference on Injury Prevention and Safety believes that if the petition is not ratified or if children under the age of 12 are not banned from the sport, up to 3% of the upcoming generation will grow up with learning disabilities. For most of the fighters, their corner is managed by their coach and trainer, but many of these men brought cheering sections with them. In the background of each fight, there is a constant rhythmic music pulsing out the tempo of the fight. The music is performed by four musicians each playing either one of two kinds of oboe, a pair of Thai drums or cymbals. 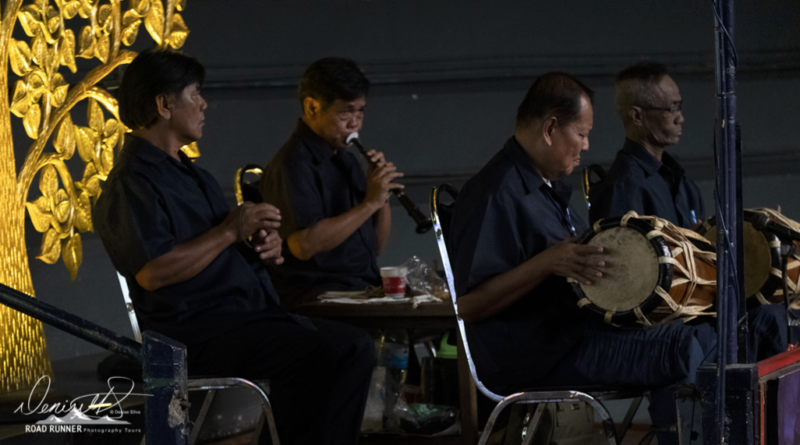 During the wai kuru ram muay, the tempo of the music starts out slow and stately to match the mood of the ritual. However, as the fight continues, the pace and intensity of the music increases, to encourage the fighters to fight harder. One thing that surprised me was the number of clean knockouts. Some of the matches lasted only a few minutes into the first round. 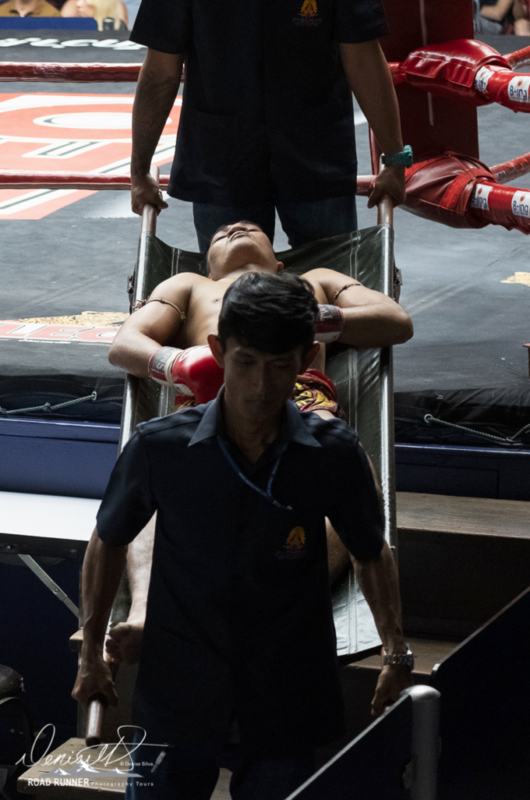 Of all the knockouts, only two individuals left on stretcher. Most got up and made their way off, albeit with help. 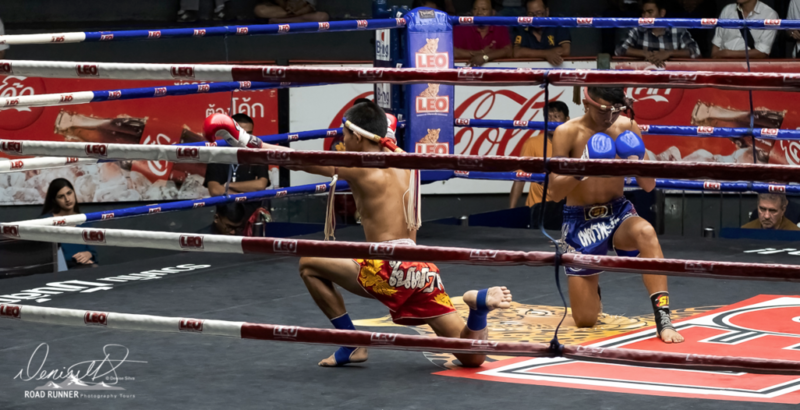 Although Muay Thai can be traced back to the 18th century, it gained wide-spread interest in the 1990s after the World Muay Thai Federation was founded (1995). There are currently more than 70 member countries, with thousands of gyms around the world. 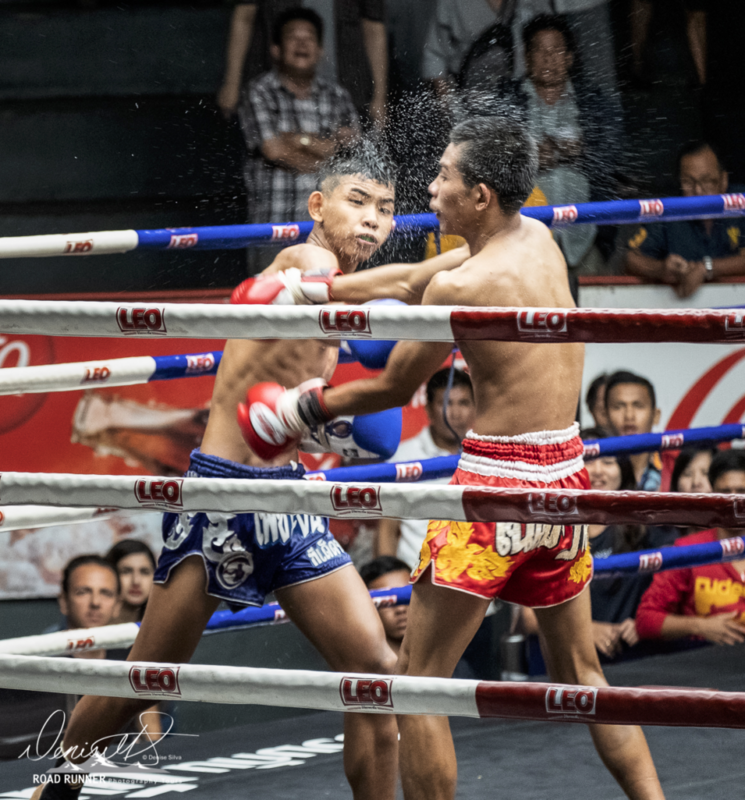 This entry was posted in Photo Tours, Travel Experiences, Uncategorized and tagged boxing, combat, fighting. 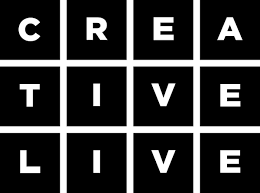 Really interesting story. And excellent photography as usual.